We love appam and we prepare it once a week. We enjoy it with sugar and freshly extracted coconut milk everytime. 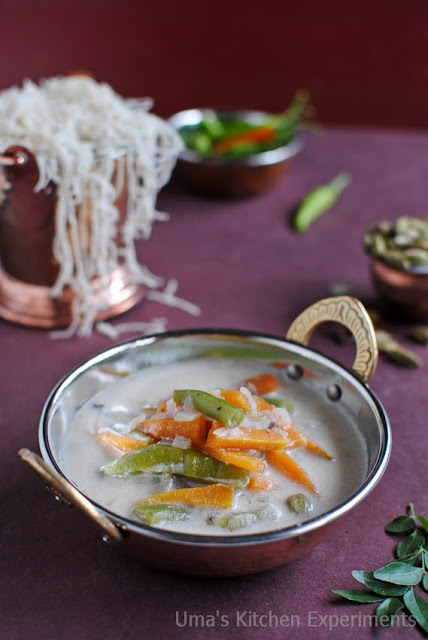 Amma occasionally makes a wonderful coconut based kurma or chutney as a side dish for it. She makes the same kurma for idiyappam as well. 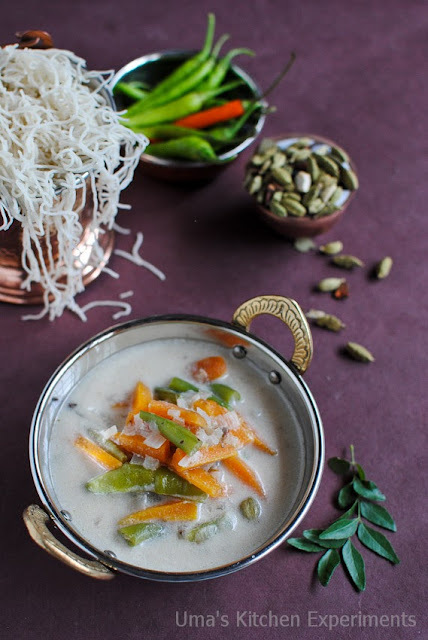 We cook kurma if we need a savory side dish for appam and Idiappam. Few months back I learnt how to cook vegetable stew from Tarla Dalal's cook book and shared my reading with my mom. She asked me to prepare it. She liked it very much except that she didn't like the flavor coming from cloves and cardamom. Since the preparation is quite easy (if you avail ready to use coconut milk), my mom learnt this recipe and said she would be cooking it all by herself next time when she makes appam. Back at home, I started preparing this stew for idiyappam and as expected it paired well with idiyappam too. 1) Chop vegetables into 2" length slices. Extract the milk from coconut using 1 or 2 cups of warm water. Add corn flour to the coconut milk and keep aside. 2) Heat oil in a pan. Add crushed green cardamom, cloves and cinnamon stick. Allow it to splutter and release a nice good aroma. 3) Add slit green chillies followed by onion. Saute for few minutes till the onion becomes soft and translucent. Onion should not change to brown colour. So, take extra care. 4) Add vegetables. Sprinkle a handful of water and add salt. Mix well. Cover the pan using a lid and cook till the vegetables are completely cooked. 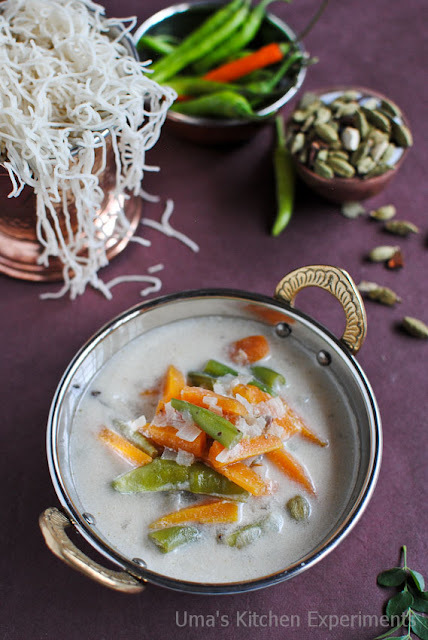 5) Once the vegetables are cooked turn the flame to low and add coconut milk. Cook for few minutes in low flame. 6) Taste and adjust the salt. Before the coconut milk starts boiling, turn the flame off. 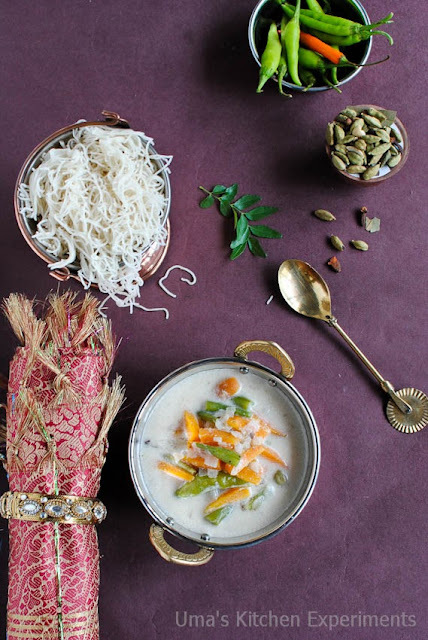 7) Serve hot with appam or idiyappam. 1) You can extract coconut milk (both thick and thin texture) separately. Later as you prefer you can cook the vegetables in thin coconut. 2) Make sure to switch off the flame before the coconut milk starts boiling. Would love to invite myself to ur place Uma to enjoy the foods you make, looks at tha stew, cant take my eyes from it..Delicious. Wonderful stew and lovely clicks.. Simple to prepare and mouthwatering stew. they make a yummmy pair. n i can easily gulp 10 idiyappams.. nice prep..